Publisher: Woodley Press, 2004, Paperback: 80 pages, 78-0939391356, $10. 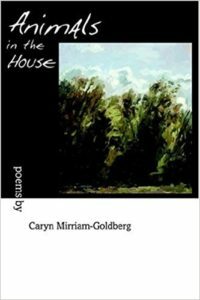 "'Nothing prepares you for the real,' writes Caryn Mirriam-Goldberg in this soaring flock of tones and images that is this wonderful book of poems. Nothing prepares us, and so we stumble and fall and break into blossom, bite persimmons, and birth ourselves again and again. How any of us weather the darkening climate of these times is a wonder; it is such books as this that help us breathe." -- David Abram, author of The Spell of the Sensuous. "Caryn Mirriam-Goldberg's voice is imbued with love, humor and wisdom. She wields plain words powerfully. Her comprehension of nature borders on the absolute. Her wonderful poems state the seamlessness of the cosmic and mundane, the molten paradoxes of intimacy and otherness, identity and separation." -- Stephanie Mills, author of Epicurian Simplicity and In Search of the Wild. "These noble, ecstatic poems reflect a woman on the edge of life and death. She runs like any animal into the dark 'that isn't so dark' and with new eyes sees there what sustains her -- a different light, a hidden room, hope and healing. Her words capture the richness of Kansas landscape and the internal wildness of animals that feed our very existence, give us courage to breathe in every minute and move on." -- Perie Longo, author, The Privacy of Wind. "Animals in the House is a collection of poems that celebrates the power of the natural world to shape us into what we're meant to be. These poems lift us out of the container we call our selves, shape us toward trusting what we can never completely know, place us more firmly on the trustworthy ground of earth that has the power to heal and renew." -- Renee Gregorio, author, The Storm That Tames Us. everyone's life in the living room. metal on the earth, wanting to return. I must have taken it. I thought, see what you've done now. unfurling in the brown haze of the sea. not bad or tricked into good. each evening to meet the fire.